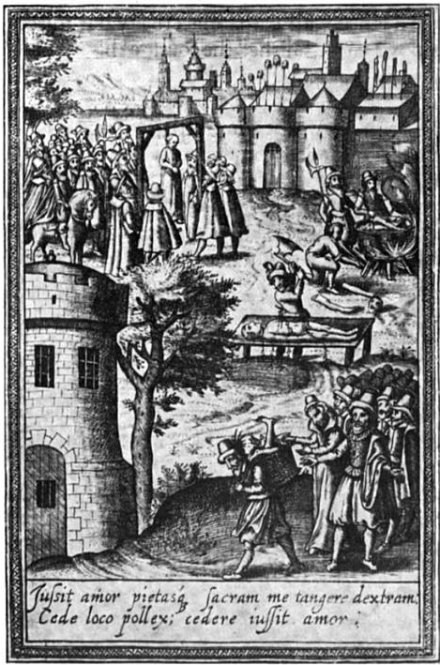 On this date in 1592, Roger Ashton was hanged, drawn and quartered at Tyburn. We’ll let the Catholic Encyclopedia take it from here. He was hanged, drawn, and quartered at Tyburn, 23 June, 1592. His indictment is not preserved. Challoner says it was for procuring a dispensation from Rome to marry his second cousin. Later evidence, while confirming this, shows that it was not the only cause. Cardinal Allen published a “Defence” of this act** in the form of a letter addressed to one “R.A.”, whose letter to the Cardinal prefixed and under these initials it seems natural to recognize our martyr. Stanley next entrusted to Ashton the difficult task of bringing over his wife from Ireland, but she was already under arrest, and he is said to have been sent Ashton to Rome. At the close of the year 1587 he returned to England and was apprehended in Kent with the marriage dispensation already mentioned. In January, 1588, he was in the Tower, where he lay ill towards the close of the year, when he was transferred to easier confinement in the Marshalsea. From this he managed to escape and fled to his brothers in Lancashire. He was seized later, at Shields near Newcastle, while trying to escape over the seas. Transferred thence to Durham and York, he was tried and sentenced at Canterbury, and died “very resolute”, making profession of his faith and “… pitied of the people”, though the infamous Topcliffe tried to stir up ill-feeling against him by enlarging on his services to Spain. Executions at Tyburn in the time of Elizabeth. From Tyburn Tree. * This event — an English commander betraying a city to the enemy during wartime (in fact, two English commanders, as Rowland York (or Yorke) handed the Spanish the fortress of Zutphen on the same day) — naturally raised a scandal in 1587. Although this treacherous William Stanley is not to be confused with the contemporaneous fellow-noble of the same name who has a horse in the “who really wrote Shakespeare?” race, Lily Bess Campbell argues that the imprint of events in Deventer and the subsequent volley of pamphleteering informs a discourse of royal prerogative in the Bard’s Henry V, when the disguised monarch goes slumming with the common soldiery on the eve of the Battle of Agincourt. Henry replies that soldiers should look after their conscience on their own time and obey the prince of the realm in wartime. No doubt Queen Elizabeth approved. euery Subiects Soule is his owne. ** The obedience due a sovereign as opposed to the obedience due to an abstract standard of Right is a lasting modern question, so it’s no surprise that Cardinal Allen’s justification has a modern ring. For that to revolt, is of itselfe, lawful or unlawful, honorable or otherwise, according to the justice, or injustice of the cause, or difference of the person, from or to whom the revolt is made … Whensoever thou art armed, & in readinesse for battayle, let this be thy first cogitation, that thy very corporal streingth itselfe, is the gift of God: whereby thou shalt stil be put in minde, never to use the gift of God, against God him selfe, that gave it thee. Presumably he wouldn’t have supported the “only following orders” defense.